I seldom spend 100 hours on anything these days, let alone a video game, but I spent at least that much time with Dragon Age: Inquisition, the latest sprawling epic RPG from BioWare, studio that brought us Star Wars: Knights of the Old Republic and the Mass Effect series. Dragon Age: Inquisition is the third game in its high fantasy franchise, and it’s easily the most ambitious. It’s also one of the most engrossing games I’ve ever played, and for a fan of this kind of conversation clicker, that’s saying something. Much of the fun of a BioWare game is often incidental to the main plot progression, as the studio has made the side quest into an absolute art. 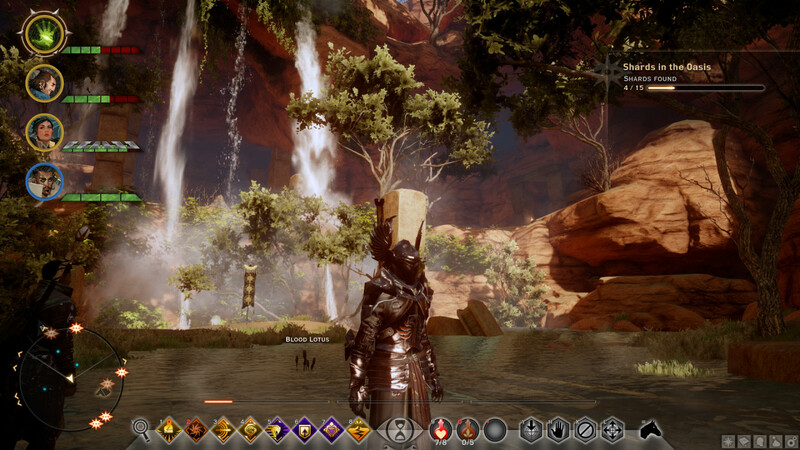 Dragon Age: Inquisition takes this to new extremes, and early in the game (as well as through the meaty middle) I felt like I could barely walk ten steps in any of the game’s multiple expansive area maps before coming across an exclamation point on my navigational HUD, a surefire indicator that someone wants you to fetch something, find someone, or clear some bad guys out of a fort somewhere. The preponderance of the sidequests seemed to involve tracking someone down for someone else only to find they’d been killed, and then having to bring back a note, token or just news of their demise, but I could be mis-perceiving the situation based on the fact that these struck me as genuinely touching moments in a game whose plot events take place in a fictional world rocked by a civil war sparked by the events of earlier games in the series. 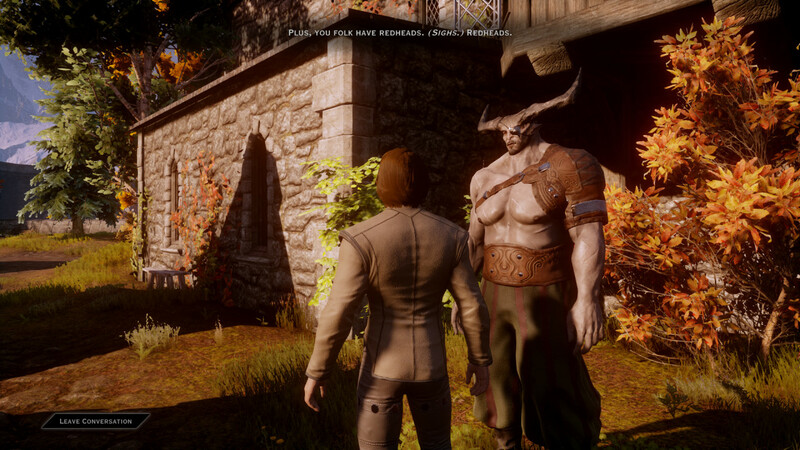 Side quests in Dragon Age: Inquisition can sometimes feel trivial (“Why am I doing this when I’m supposed to be spearheading a nation-unifying political movement?”) but more often than not, you’re not sure when a mission might result in something that will contribute to your overall success, perhaps by recruiting an agent, or by triggering an important progression in the relationships you hold with other party members and important NPCs. Of the 100+ hours I spent playing Dragon Age: Inquisition, I’d estimate that at between 75 and 85 percent of that was spent on side quests, which include lowly throwaway fetch missions, as well as micro-arcs around fellow party members that change the way the game progresses. There’s a plot line here that drives the action more so than the main story in say, Skyrim, which is very similar in other regards, but side quests are still a key ingredient, and a more important aspect of the overall play experience than they have been in any other previous BioWare title, which is why it’s a good thing that they’re varied, rich and interesting in their construction. 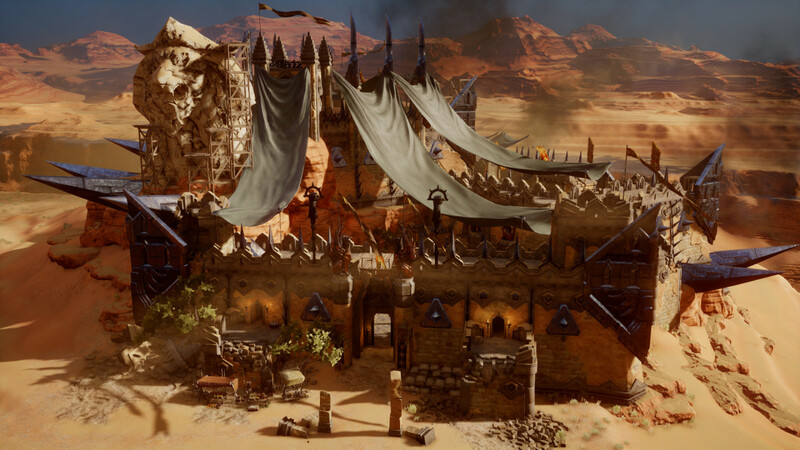 The core Dragon Age: Inquisition storyline offers a fairly weighty task to the player – lead a religious movement designed to cross political boundaries and bring a warring nation together, in time to fight a common enemy. The mission’s ethical quandaries are also expressed by its name; in the mythical Dragon Age realm, “inquisition” means something quite different than it does in our real world with our actual human history, but that doesn’t stop it from evoking some uncomfortable associations with players with at least some sense of the progression of civilization. Players can influence how driven by a sense of religious entitlement their hero, and the Inquisition itself, ends up being, but at heart it’s bound up in events that are characterized as miraculous, and the movement’s followers seem bound to its mission by a sense of faith, above all else. Your character’s job is to ensure the success of the Inquisition, sometime manipulating that sense of belief to win over political allies. NPCs and party members can help guide the player to make more faith-based, or more logic-based decisions, however, changing the overall tenor of the movement and, to some extent, the attitudes of the people who join it. Admittedly, if you’re not a fan of the series, it may be hard to access the world, shaped as it is by the actions of the previous games. But the game does provide enough background to situate new players, without giving them the advantage of knowing how the mage/Templar war came to be through events of previous Dragon Age games. New players also won’t be as appreciative of cameos from characters in those older games, and some of the lore seems glossed over, but in any BioWare game the lore is so deep that you could spend 100 more hours just poring over texts and tomes, so don’t let a lack of familiarity keep you from the game – it’s as good a jumping in point as any for those curious about Dragon Age but without the three solid weeks of free time that would be required to get caught up by playing through from the beginning. 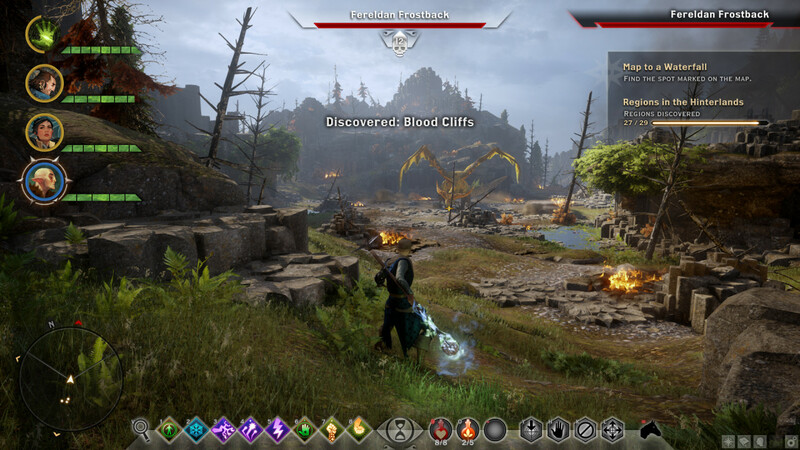 Fighting in Dragon Age: Origins offers choices to the player – you can treat it as a traditional action RPG, with real-time combat and button mashing, or you can pop out with a bird’s-eye view of the battlefield, calling out actions and controlling your entire party at once while advancing time in short bursts. The nod to strategic players is appreciated, but ultimately I used it a total of three or four times, and at least one of those was when I was forced to in order to solve a puzzle that required multiple party members performing actions simultaneously. It’s worth noting that I also tend to play BioWare games on easier combat settings, since I’m generally playing for the epic story, not for the scattered fights. Still, the new combat system did nothing to impose upon my experience – BioWare was wise to make sure they kept a basic hack-and-slash mode intact. The action-oriented combat system is made better with the simple potion menu, and the lack of any kind of really effective healing spells puts a new twist on strategy; facing dragons essentially means you’ll need a health stock of elixirs to back you up, and buffing your characters with weapons and armor that return health on kills becomes paramount if you want to stay out in the field for long periods without returning to a camp or your Inquisition stronghold to resupply. Dragon Age’s world is steeped in history – you could easily offer university degrees in its particular blend of mythology, lore, and political drama. The various documents, books and texts you find scattered throughout the land help illuminate the world’s history, as do conversations (and depending on what perks you select for your character, you’ll learn more or less about various aspects through talking to others). 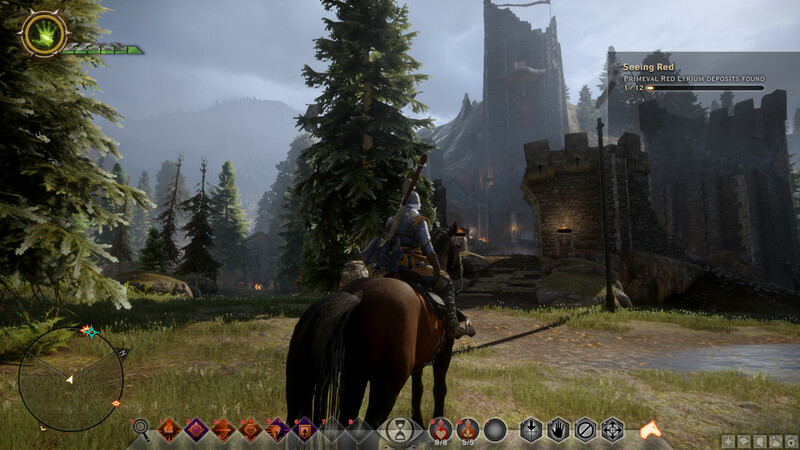 You can almost treat Dragon Age: Inquisition as a kind of sprawling, richly-animated interactive Wikipedia in this regard, and it’s rewarding to do so – providing you have no other hobbies and want to commit something like 2,000 hours to the title. My 100 hours of play included skipping through much of the dialogue, while speed-reading the subtitles that helpfully and automatically appear when you use the skip function. I almost feel bad because character voice acting is so well done, as are animations and general visuals (though character models in particular suffers from a strong uncanny valley effect), but the truth is that BioWare games are literally so rich that no one has time to do everything. That said, were my free time infinite, and if I could feed intravenously and expel waste in the same manner, I would love nothing more than to read the entirety of Dragon Age’s histories, myths and legends. As for the story itself, the main plot is well-told, but some of the most interesting stories are actually incidental, focusing on your fellow adventurers. There’s a playable gay male mage whose quests involve confronting a disapproving father, and a trans male mercenary whose compatriots can teach the player valuable lessons about acceptance and respecting the gender identities of others. Romance options for the player run the gamut, too, making this one of the most socially advanced video games I’ve ever played – it’s quite literally inspirational in some instances. Dragon Age: Inquisition is a sequel in one of the few game series’ that I’ll play each instalment of, regardless of quality, but in this case my faith has been rewarded – BioWare has crafted a real gem with this one. It has a scale that’s almost mind-boggling, with multiple, huge free-roaming maps that offer amazingly pretty environments. It has expertly crafted party members that each have their own rich story to explore. It has a main storyline that’s cohesive, grand and well-told, with simplicity that’s easy to grasp for more casual players, but additional depth for those willing to explore the world and its mythos. I ran into some annoying bugs while playing, most of which involved getting frozen in mid-conversation, but thanks to frequent autosaves it was never a huge issue. There’s also lots more than what I mention above working in Dragon Age: Inquisition’s favor – crafting, for instance, multiplayer dungeon crawling and assigning NPCs to carry out missions that bring you bonuses and can run in the background. But more than ever, Dragon Age: Inquisition is a BioWare game, meaning it offers up a bounty too big for any one person to harvest entirely, but it’s amazingly rewarding to try.